I feel like I’ve been suffering chronic fatigue and have thus been feeling very lazy about all things domestic. There are many reasons for this, I think. First, I had to catch up on sleep after a wild 5 days in Hong Kong. But since I came back just in time for the first day of school, I spent this past week walking madly around my mammoth-size campus trying to register in interesting classes. (I can’t tell you how tempting it is sometimes to just jump into a taxi somewhere along the way, as there isn’t such thing as being fashionably late for class here.) Of course, I had to attend 9 different classes, before settling on ones I thought I would be able to endure/enjoy. After lectures, I have Korean language class from 4pm-6pm everyday. Then I have to embark on another 30 minutes walk home while winter here persists. Once I get back, I really don’t have the courage to muster up anything more exciting than fried rice. But then I met a girl in my Northeast Politics class from UdM, who lived almost an hour away from school. She told me that she and her roommate (also from Montreal) cook dinner together every single day. AND they make food that they buy at the local market near their apartment. Damn. So yesterday, I finally cleaned out all the things that were getting mouldy in my fridge, and went to the grocery store. (I swear I will start going to the markets once the weather gets warmer). I also bought a cork-screw and a pound of mussels. I thought this was going to be a quick and easy dinner. The recipe said 20 minutes from start to finish. 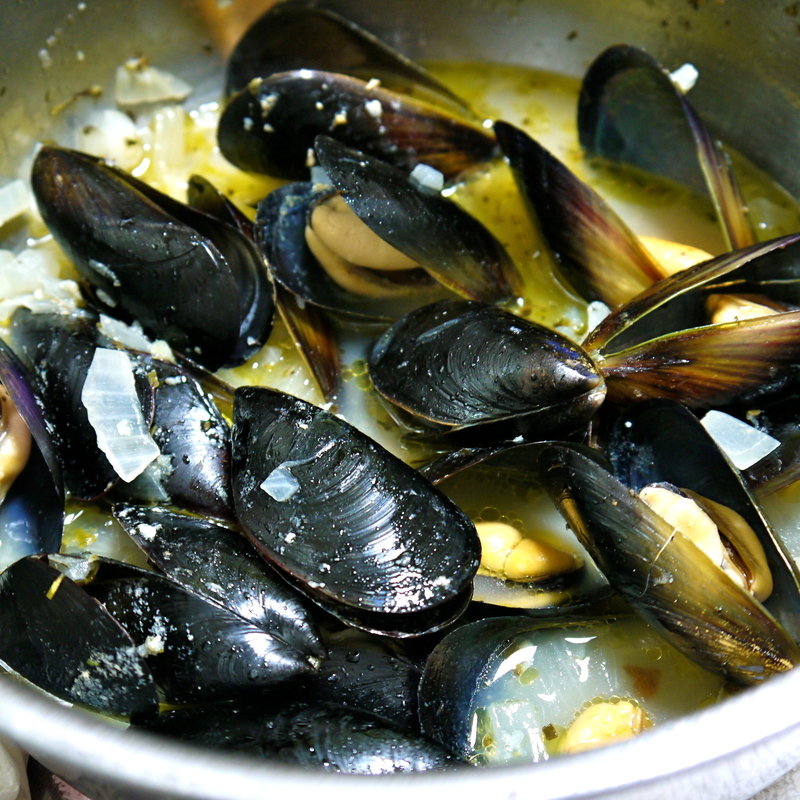 But it turns out that handling mussels is actually messy business involving soaking, scrubbing and beard removing, all while trying to not accidentally kill one of them before cooking. Once that was done though, it was smooth sailing. Olive oil, butter, onions, garlic, white wine and some salt and pepper were all it took to make this mouth-watering dinner. We ate it with crusty white bread, and then saved the rest of the juice for a pasta sauce later. YUM! If it weren’t loaded with cholesterol, I would make this all the time. This entry was posted in Uncategorized by sugarandseoul. Bookmark the permalink. I’m sure you meant a cork-screw, and not a bottle opener!!! Great read. Keep it up!